Are your children abusing drugs or alcohol? You may be confident that they’re not… but are they abusing performance-enhancing drugs? What are the warning signs? How can you protect your family? Here are some tips, courtesy of the Virginia Chiropractic Association (VCA). We’ve seen drug scandals ruin the lives and careers of Olympic athletes, baseball players, and many others. Athletes seek out every competitive edge in order to gain fame, glory, and financial reward; but the problem often starts early. A CDC study showed that 6.1 percent of students had taken steroids at least once in the absence of a valid prescription.i Another study found that up to 11% of adolescent males report steroid abuse — but the problem isn’t only a male one. The same study indicated that up to 2.5% of females report abusing anabolic steroids.ii Up to 1 million high school students have taken at least one cycle (8-12 weeks) of anabolic steroids.iii These substances are used to promote muscle growth. Some youths will use such steroids to leverage their odds of getting a scholarship, making the pros, or even just fitting in with their peers. Powerfully influenced by the media, both boys and girls may consider abusing substances to fit a particular body image. In sports that require power and strength, human growth hormone and anabolic steroids are commonly abused. In addition, athletes in a variety of sports may also use these substances to recover faster between workouts… which sounds reasonable, if not for the potentially horrific side effects. 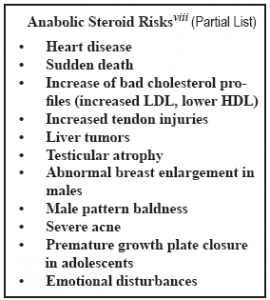 The risks of steroids are many (see insert). Parents need to be on the look¬out for warning signs, which include mood changes, irritability, and outbursts of anger (“roid rage”)… all of which may happen during normal puberty. Yellowed eyes, testicular shrinkage, diarrhea, headaches, nausea, sleep problems, severe acne, paranoia, baldness, breast growth changes (enlargement in males, retarda¬tion in females), facial hair growth in females, deepening of the voice (females), and unreasonable and sudden increases in muscle mass are NOT typical signs of puberty, and parents should be aware of these cues.iv & v Athletes from recreational to professional have discovered a safe, effective, and legal way to boost performance: chiropractic care. Sports superstars, Olympic teams, college teams, and the pros routinely integrate chiropractic into their protocols. Football great Emmitt Smith put it this way: “I found a specialist [chiropractor Dr. Rob Parker] that’s really good in balancing out my body to make sure my hips are rotated right and my body is functioning properly. I remember somebody telling me that what I put myself in during the games is like having a car wreck every Sunday… That stuff takes its toll. But if you take advantage of health care, balance your body back out, put it back where it’s supposed to be, you function better and you recover faster.” vi Back in 2007, pro skateboarder Jake Brown took a 40 foot fall that knocked off his shoes and rendered him uncon¬scious. His plan for getting back to peak form was simple: “I was pretty sure if I just got some massage, some chiropractic, stretched and ate healthy, I could get back out there pretty quickly.”vii Within 4 months, he was back to competition… not bad, considering that his fall also bruised a lung and his liver, and fractured both a vertebra and his wrist. Chiropractic works to balance the human frame, helping joints and muscles function with optimal biomechanical efficiency. In the world of competitive athletes, every edge is critical; and so is fast and safe recovery from injury. Doctors of chiropractic may be able to help athletes young and old perform their best, thus helping them achieve their goals while potentially preparing them for a lifetime of health and fitness. The best “sports docs” are well integrated into their communities, and will be honored to help tomorrow’s aspiring stars reach their full potential. i Morbidity & Mortality Weekly Report. Youth Risk Behavior Surveillance-US, 2003. The Centers for Disease Control and Prevention. May 21, 2004. Vol. 53. No. SS-2. http://www.cdc.gov/mmwr/PDF/SS/SS5302.pdf. ii Terney R, McLain LG. The use of anabolic steroids in high school students. AJDC. 1990;144:99-103, iii http://www.msnbc.msn.com/id/7348758/. iv http://www.acsm.org/Content/ContentFolders/NewsReleases/2003/STEROIDS_THREAT-EN_HEALTH_OF_ATHLETES_AND_INTEGRITY_OF_SPORTS_PERFORMANCE.htm. v American College of Sports Medicine, as noted at http://www.acsm.org/Content/ContentFold-ers/NewsReleases/2003/STEROIDS_THREATEN_HEALTH_OF_ATHLETES_AND_INTEG-RITY_OF_SPORTS_PERFORMANCE.htm. vi Emmitt Smith, as quoted in the Fort Worth Star- Telegram, as reprinted at http://www.pphcc.com/testimonials.php. vii As reported in AP, Yahoo Sports news, and other media. viii See v.